Nebraska Area Codes #infographic ~ Visualistan '+g+"
Nebraska is located in the Midwest region of the United States while also being part of the Great Plains. It’s the only triple-landlocked U.S. state, where if people want to reach an ocean, gulf, or bay, they need to cross at least three other states. Although Nebraska has a population of nearly 2 million, 89 percent of its cities have a population of under 3,000 citizens, and Omaha alone is home to roughly 900,000 people. In 1947, the year all the area codes were created, the entire state of Nebraska was covered by area code 402. However, in 1954, 402 was split and area code 308 was created, with the state being split into the western and eastern regions. The boundary line has an “S” shape, crossing the state from the northwest to south. It runs through the Sandhills, which is an area with prairie lands and sand dunes; and the Platte River, which is 310 miles long, but if measured from the source, flows for over 1,050 miles. Area code 402 covers 49 counties in eastern Nebraska, including Lancaster and Sarpy, but also the two most populous cities, Lincoln and Omaha. The western region, however, is covered by area code 308, which surprisingly also includes 49 counties such as Hall and Buffalo, and Nebraska’s third most populous city, Grand Island. In 2011, due to a limited supply of phone numbers, 402 was overlaid with the area code 531, and 10-digit calling became compulsory in the same year. Area codes 402 and 531 together now serve 12 major cities in Nebraska. 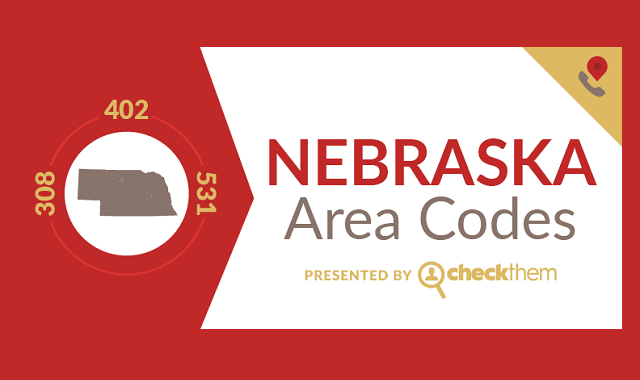 Read on to learn more about Nebraska’s area codes.